Only a few weeks removed from Nikon’s mirrorless announcement, Canon has now made a big mirrorless announcement as well in the EOS R. Now both of the biggest players in digital photography have entered the mirrorless market. As I noted in my previous article on Nikon’s release, I think competition is great for consumers and I am very interested to see how the mirrorless market develops over the next few years. I think we will see great innovation and some fantastic cameras and lenses. Sony has had great success, but both Canon and Nikon are making a splash. But, let’s focus on Canon’s new mirrorless camera – the EOS R (https://www.usa.canon.com/internet/portal/us/home/products/details/cameras/eos-dslr-and-mirrorless-cameras/mirrorless/eos-r). 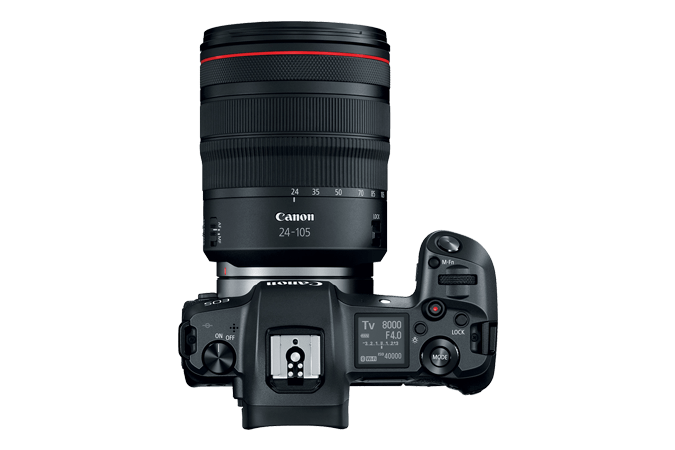 The EOS R is available for pre-order now at a price of $2,299.00 and is expected to ship mid-October. The EOS R features a new ‘RF’ lens mount and Canon will release four native RF lenses to accompany the camera; Canon RF 24-105mm F4L IS USM, Canon RF 28-70mm F2L USM, Canon RF 35mm F1.8 IS STM Macro, and the Canon RF 50mm F1.2L USM. Canon has not announced a time frame for new RF lenses, but there are definitely more on the way. 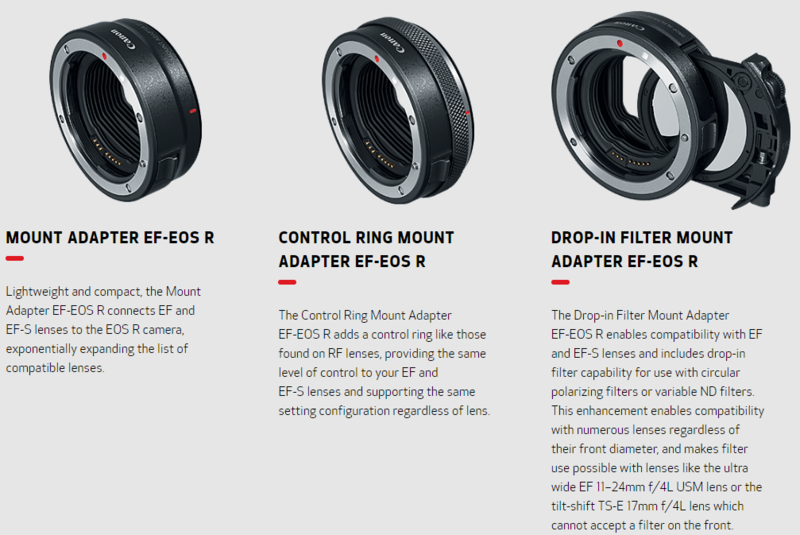 Canon is also releasing lens adapters so all your Canon EF lenses can be adapted. A lot have been quick to criticize Nikon and Canon’s initial mirrorless offerings. I for one think both releases are pretty promising. Canon and Nikon are going to give Sony a run for their money eventually – and that could happen sooner than later. A big design feature being overlooked is the fact that Canon and Nikon have a much wider mount diameter in their mirrorless bodies (54mm for the Canon EOS R, 55mm for the Nikon Z6/7). Sony’s current mount is 46.1mm. So what does that mean? Well, in a nutshell it means that Canon and Nikon should have the advantage of being able to create lenses that have better optical performance than Sony…at least in the near future. I am personally excited for Nikon’s lens releases over the next few years and I will be buying Nikon’s mirrorless camera. If you’re a Canon user, you should be excited too. The EOS R has 5,655 focus points. 5,655. That’s more than ten times the Nikon Z6 and Z7 (273 and 493 focus points respectively). Canon has been quick to market the EV -6 to 18 in one-shot AF. Many testers have reported using the EOS R in situations with almost non-existent light and its focusing has been lightning fast. That’s a great sign for wildlife photographers. EV is hard to understand, but EV -6 is equivalent to an exposure of 30s, f/2.8, ISO 1600…that’s pretty much the settings you’d use to photography the Milky Way…so the focus system is looking pretty amazing on this camera. In good lighting, it should be the fastest focusing camera on the market right now. Canon is trying hard to think outside the box with this camera, and two exclusive EOS R features are the control ring on the RF lenses and the touch bar near the EVF. Canon’s new RF mount lenses introduce an interesting new feature in the control ring. The control ring joins the zoom and manual focus ring on the lenses, it allows users to actually change key camera settings directly through rotating the ring. 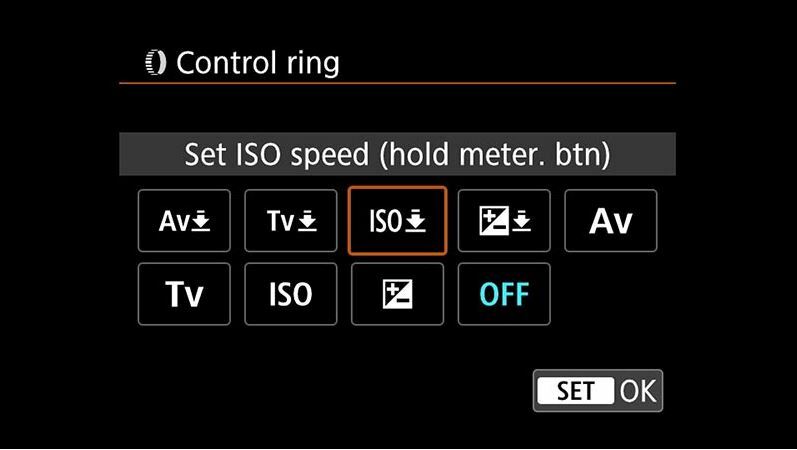 With the ring, you’re able to change shutter speed, aperture, ISO, or exposure compensation. You can do this simply by rotating the dial. This could be a really useful feature and it’s good to see Canon try and do something different from the rest of the crowd. The touch bar is pictured below. Users can now swipe left or right on the touch bar to change numerous camera settings, just ring the control ring. Like I said, it’s the first camera to offer something like this so we’ll see what initial users say about its usefulness. I was disappointed to see that the EOS R does not have body stabilization. I mentioned how in-body stabilization is one of my favorite mirrorless features and I’m not sure why Canon didn’t include it. The RF lenses released do not have image stabilization built in either, which means that Canon mirrorless users will have to wait for new lenses to get any type of stabilization. 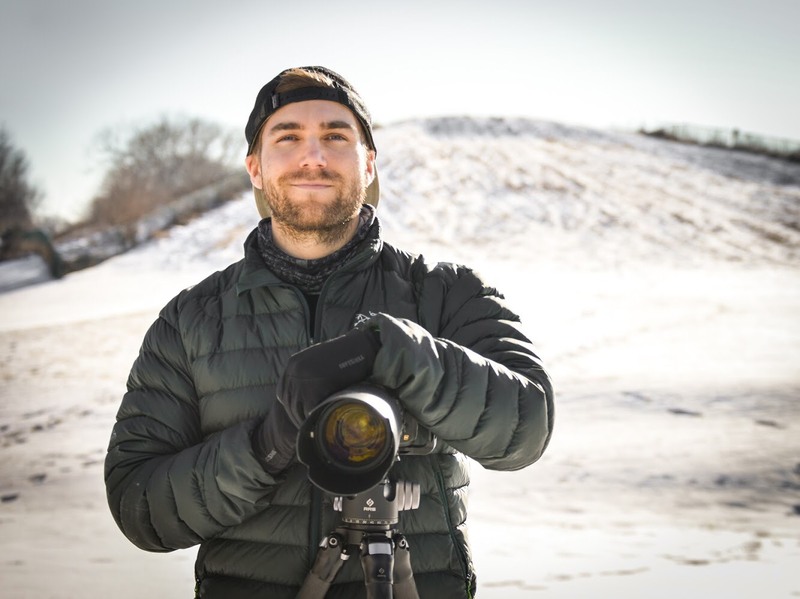 In-body stabilization is one of the most important features to me as a landscape photographer and I think mirrorless technology will render our tripods useless someday (crossing my fingers). 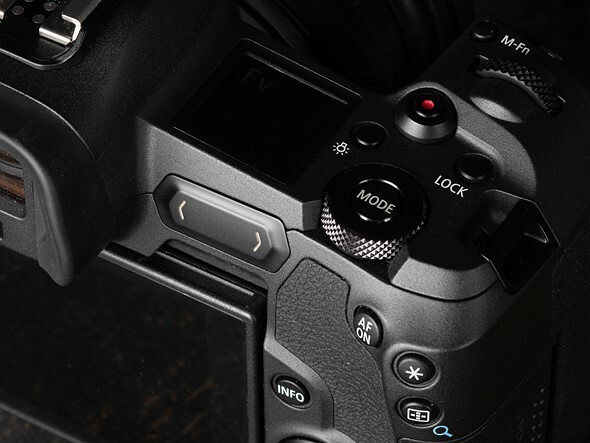 The EOS R also has a single card slot like the Nikon Z6/Z7. That doesn’t affect me, but I know many photographers are upset about it. Overall, it looks like the EOS R is a very nice camera. If you’re a Canon user and you want to make the switch to mirrorless, you are now able to without having to jump ship to Sony. The EOS R is a super capable body and any Canon lens can be adapted while we wait for more RF lenses. If the focusing abilities are as good as they seem, this could be a really nice camera for wildlife photography. Reports say that the EOS R has improved dynamic range as well. That’s good news as Canon has lagged behind Sony and Nikon in that respect. My recommendation is the same as what I suggested for the Nikon bodies…wait until more native lenses are released. A year or so from now, there will be more lenses available and there’s a good chance we’ll either see a new body release or at least a Mark II version. I jumped ship from Nikon to Olympus about 4 years ago. When I talk to friends who also shoot Olympus mirrorless cameras we were surprised by how much CaNikon didn’t learn from the existing mirrorless cameras from Olympus, Panasonic, Fuji, and even Sony. BTW, Sony still hasn’t picked up a lot of the functionality from the others either. The only thing I’ve been able to come up with is CaNikon are releasing these as low/mid tier cameras with more capable cameras to come. Its also possible that they may pick up on the long established trend in mirrorless to add functionality via software, something neither of them has ever done, they want you to buy a new or more expensive camera to get what is effectively better software. Ironically, the lack of software functionality not hardware is what got me to switch in the first place. And before anyone says you need full frame, I’m willing to put my images from my Micro Four Thirds camera up against anyone’s full frame in 95% of shooting situations. Hawaii Volcanoes National Park Makes Plans to Re-Open Long Dormant Yellowstone Hot Spring is erupting!